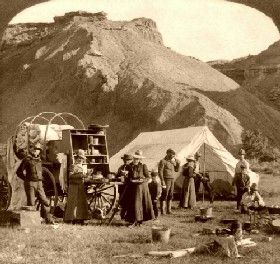 Wyoming Badlands 1904. Click for prints, downloads and products. Lightly grease inside of dutch oven. On a lightly floured surface, flatten thawed dough slightly. Cut each loaf into 4 pieces (total of 8). Form each piece into a rope about 18″ long. Brush each rope on all sides with melted butter. Stir together sugar, brown sugar, and cinnamon. Place mixture on sheet of foil. Roll rope in sugar mixture to coat evenly. Shape rope into a coil in the center of the dutch oven. Roll another rope in sugar. Attach securely to end of first rope and continue coil. Continue coating ropes and attaching to form a 10-11″ circle. Sprinkle any remaining sugar over coil. Sprinkle with chopped pecans. Cover and let rise in a warm place for about 30-40 min. Bake at 350 for 30 to 3 min or till done. Cover with foil last 15 minutes to prevent over browning if necessary. Cool about 15 min. Stir together powdered sugar, vanilla, and enough milk to make a thick glaze. Spoon over top of cake. Decorate with cinnamon sticks and pecan halves, if desired. Serves 16. For a big Dutch oven use more ham/cheese/corn and double the topping. You can also add in anything you like such as black olives, onions, mushrooms, etc. Line the Dutch oven with foil all the way up the sides and grease or use non-stick spray. Put a 1/2 inch layer of ham on the bottom, then a layer of corn and a layer of cheese, and then sprinkle on some Italian seasoning. Mix the milk, eggs, and Bisquick until well blended. Pour on top of ham/corn/cheese layers making sure the liquid is evenly distributed. Cook for about 1/2 hour (about 350 degrees) until casserole sets up. To serve pull the foil out of the Dutch oven and peel it away from the casserole and cut into wedges. Serves 6-8. Bake chicken in dutch oven for 40-50 minutes or until done at about 350 degrees. Use 4-6 Briquettes on bottom and 12-16 on top. Meanwhile, mix together everything except water and starch. Bring to a boil. Mix water and starch and add to boiling mixture. Stir until thickened. Spoon over chicken the last 20 minutes of cooking. Sauce may be made ahead. Bring broth and seasonings to boil. Meanwhile slice tortillas into thin strips. Place in the boiling broth and cook for about 15 minutes. Add chicken pieces and cook for 15 more minutes uncovered. Serves 4-6.